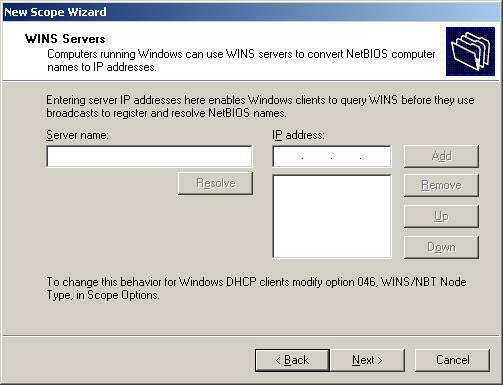 The DHCP server assigns a client an IP address taken from a predefined scope for a given amount of time. If an IP address is required for longer than the lease has been set for, the client must request an extension before the lease expires. If the client has not requested an extension on the lease time, the IP address will be considered free and can be assigned to another client. If the user wishes to change IP address then they can do so by typing "ipconfig /release", followed by "ipconfig /renew" in the command prompt. This will remove the current IP address and request a new one. 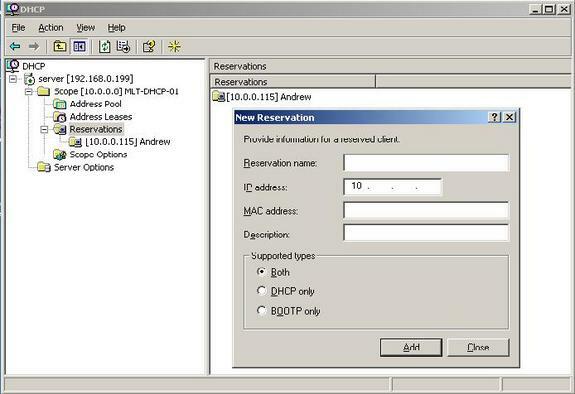 Reservations can be defined on the DHCP server to allow certain clients to have their own IP address (this will be discussed a little later on). Addresses can be reserved for a MAC address or a host name so these clients will have a fixed IP address that is configured automatically. Most Internet Service Providers use DHCP to assign new IP addresses to client computers when a customer connects to the internet - this simplifies things at user level. The above diagram diplays a simple structure consisting of a DHCP server and a number of client computers on a network. The DHCP Server itself contains an IP Address Database which holds all the IP addresses available for distribution. 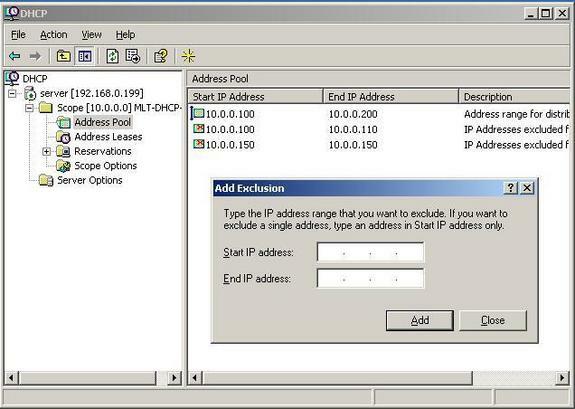 If the client (a member of the network with a Windows 2000 Professional/XP operating system, for example) has "obtain an IP address automatically" enabled in TCP/IP settings, then it is able to receive an IP address from the DHCP server. This will serve as a step-by-step guide on how to setup a DHCP server. Installing the DHCP server is made quite easy in Windows 2003. By using the "Manage your server" wizard, you are able to enter the details you require and have the wizard set the basics for you. Open to "Manage your server" wizard, select the DHCP server option for the list of server roles and press Next. You will be asked to enter the name and description of your scope. Scope: A scope is a collection of IP addresses for computers on a subnet that use DHCP. 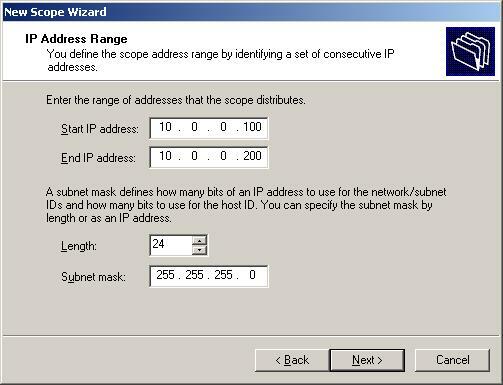 The next window will ask you to define the range of addresses that the scope will distribute across the network and the subnet mask for the IP address. Enter the appropriate details and click next. You are shown a window in which you must add any exclusions to the range of IP addresses you specified in the previous window. If for example, the IP address 10.0.0.150 is that of the company router then you won't want the DHCP server to be able to distribute that address as well. In this example I have excluded a range of IP addresses, 10.0.0.100 to 10.0.0.110, and a single address, 10.0.0.150. In this case, eleven IP's will be reserved and not distributed amongst the network clients. It is now time to set the lease duration for how long a client can use an IP address assigned to it from this scope. It is recommended to add longer leases for a fixed network (in the office for example) and shorter leases for remote connections or laptop computers. In this example I have set a lease duration of twelve hours since the network clients would be a fixed desktop computer in a local office and the usual working time is eight hours. You are given a choice of whether or not you wish to configure the DHCP options for the scope now or later. If you choose Yes then the upcoming screenshots will be of use to you. Choosing No will allow you to configure these options at a later stage. The router, or gateway, IP address may be entered in next. The client computers will then know which router to use. In the following window, the DNS and domain name settings can be entered. The DNS server IP address will be distributed by the DHCP server and given to the client. If you have WINS setup then here is where to enter the IP Address of the WINS server. You can just input the server name into the appropriate box and press "Resolve" to allow it to find the IP address itself. The last step is to activate the scope - just press next when you see the window below. The DHCP server will not work unless you do this. The DHCP server has now been installed with the basic settings in place. The next stage is to configure it to the needs of your network structure. Here under is a simple explanation of how to configure a DHCP server. 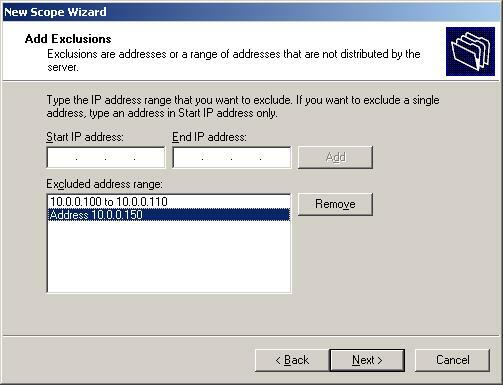 The address pool displays a list of IP ranges assigned for distribution and IP address exclusions. You are able to add an exclusion by right clicking the address pool text on the left hand side of the mmc window and selecting "new exclusion range". This will bring up a window (as seen below) which will allow you to enter an address range to be added. Entering only the start IP will add a single IP address. DHCP servers permit you to reserve an IP address for a client. This means that the specific network client will have the same IP for as long as you wanted it to. To do this you will have to know the physical address (MAC) of each network card. Enter the reservation name, desired IP address, MAC address and description - choose whether you want to support DHCP or BOOTP and press add. The new reservation will be added to the list. As an example, I have reserved an IP address (10.0.0.115) for a client computer called Andrew. If you right click scope options and press "configure options" you will be taken to a window in which you can configure more servers and their parameters. These settings will be distributed by the DHCP server along with the IP address. Server options act as a default for all the scopes in the DHCP server. However, scope options take preference over server options. In my opinion, the DHCP server in Windows 2003 is excellent! It has been improved from the Windows 2000 version and is classified as essential for large networks. Imagine having to configure each and every client manually - it would take up a lot of time and require far more troubleshooting if a problem was to arise. Before touching any settings related to DHCP, it is best to make a plan of your network and think about the range of IPs to use for the computers.